Awards were presented at the Hyatt Regency in Downtown Minneapolis where this year's keynote speaker and Lifetime Achievement Honoree was Minneapolis mayor R. T. Rybak. Receiving the award on Skyline's behalf was Skyline Chief Financial Officer, Jeff Meyer. Skyline largely attributes its growth to sustained new product development. "Skyline has a history of developing new products to meet changing times and needs," stated Meyer. "And we will continue to invest in product design and engineering to bring the best new exhibiting solutions to market." Skyline has earned over 100 product and design patents since its inception in 1980. In 2012, Skyline was awarded the prestigious Outstanding Corporate Innovator award from the Product Development and Management Association (PDMA). The OCI is the only global innovation award that recognizes companies for demonstrating sustained and quantifiable success in developing new products and services. The other 2012 recipients were the Clorox Company and Faurecia Automotive Seating, the world's sixth largest automotive supplier. Past OCI Award recipients include some of the largest, most recognizable brands in the world. A few of the winners are Apple, Bausch & Lomb, BMW, Chrysler, Dow, FedEx, Harley-Davidson, Herman Miller, Hewlett-Packard, Merck, PepsiCo, Xerox and a host of others. Skyline is the smallest company to win the award and the only company from the exhibit industry. 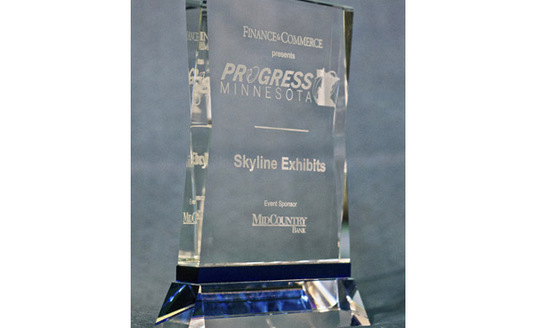 The Progress Minnesota award goes hand in hand with Skyline's core purpose, which is Helping the World Trade. "It's what we do," added Meyer. "We develop innovative ways to help our clients conduct business, which leads to their growth, which promotes a healthy economy -- in Minnesota and around the world." Skyline has over 80 Design Centers in North America and representation in 31 countries. Skyline Exhibits is North America's leading brand of exhibit systems. Known for high-quality manufacturing, cost-saving portability, innovative functionality, creative design and exhibitor education, Skyline has nearly 100 Design Centers in North America and representation in over 30 countries. The company manufactures a broad range of products for trade shows and events -- from banner stands and pop-up displays to large custom modular exhibits. With 20 integrated exhibit systems, state-of-the-art production of large-format graphics and options for exhibit rental and services, Skyline provides exhibit solutions for virtually any size or budget.